It turns out the warming climate is good for something. The children of Marcelin and Francine Dumoulin of Switzerland finally might find out what happened to their parents 75 years ago. One daughter, 79-year-old Marceline Udry-Dumuolin, says her parents left their house to milk their cows one day in 1942. But, she says they did not return. The family lived high in the mountains, at an elevation of about 2600 meters. People from nearby villages searched for the man and woman for over two months. But the search was unsuccessful. Many people believed the couple fell into a crevasse, or a deep divide in the land. Young Marceline and her five siblings went to live with other families. She said she and her brothers and sisters spent their entire lives looking for their parents so they could have a proper funeral. Now, people who work for a company that operates ski lifts may have found the Dumoulins in melting ice. An employee was doing work on one of the lifts last week when he says he saw something strange. 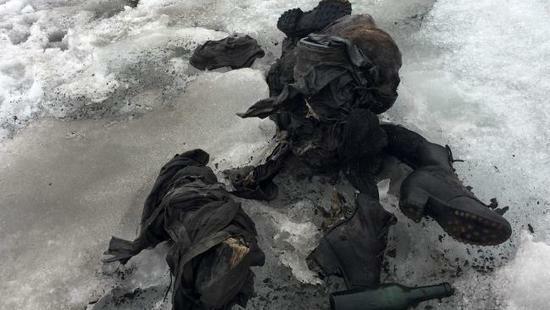 He found two bodies, a man and a woman, close together in the Tsanfleuron glacier. They were wearing clothing from the 1940s and had items like a backpack and food container. Police said they will do a DNA comparison to find out for sure if the bodies are the missing Doumoulins. The director of the ski lift company said the bodies were "perfectly preserved." Many people around the world reacted to the news. One Twitter user, Amber, wrote: "Wow! This now ends the agony of the family left wondering how/where the couple disappeared." The newspaper Le Matin reported that daughter Marceline said "this news calms me deeply." She also said if the bodies turn out to be those of her parents, she will not wear black to their funeral. She said, "I think white will be more appropriate. This represents hope, which I have never lost." They have been turning out great blades for 400 years. Where can I get on the ski lift? The declaration deals with disarmament and the non-proliferation of nuclear weapons. WMO says a warming climate can exacerbate air pollution. 1.Police said they will do a DNA comparison to find out for sure if the bodies are the missing Doumoulins. Would you call me as soon as you find out? 2.Many people believed the couple fell into a crevasse, or a deep divide in the land. He fell into disfavor as the president fell in the polls. Totally exhausted, he tore his clothes off and fell into bed.